Ketcham, Hulsey, Gage – See Them Next Week in Boston! 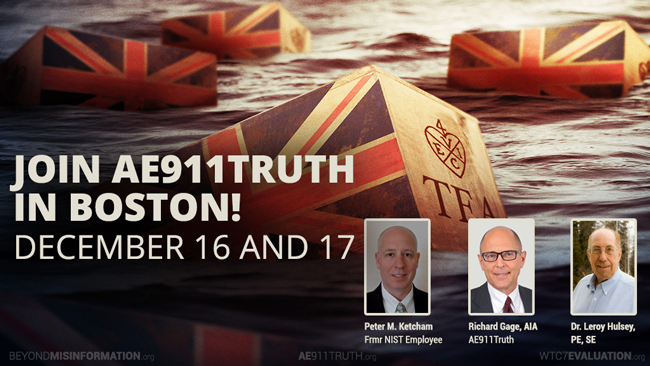 Wherever you are next week, find a way to join AE911Truth for two stimulating events in Boston on December 16 and 17 — the anniversary of the historic Boston Tea Party in 1773. Peter Michael Ketcham, the former NIST employee who recently spoke out in Europhysics News, will be coming from Wisconsin for his first public appearance, and Dr. Leroy Hulsey, the engineering professor who is approaching the completion of his WTC 7 computer modeling study, will be flying in all the way from Alaska. We look forward to seeing you there, too! 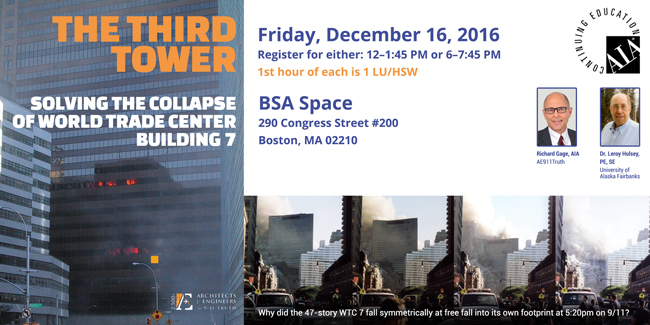 Join us on December 16 at the BSA Space for presentations by Richard Gage, AIA, and Dr. Leroy Hulsey, PE, on the collapse of WTC 7. In Part 1 of the event, Mr. Gage will provide an overview of the evidence related to the collapse of WTC 7. As an AIA CES-approved course, it will be worth one HSW Learning Unit for architects in attendance. In Part 2, Dr. Hulsey will discuss the preliminary findings of his computer modeling study on WTC 7. Their presentations will be delivered back-to-back twice — first in the afternoon, then in the evening. Admission is free. Register soon as seating is limited! 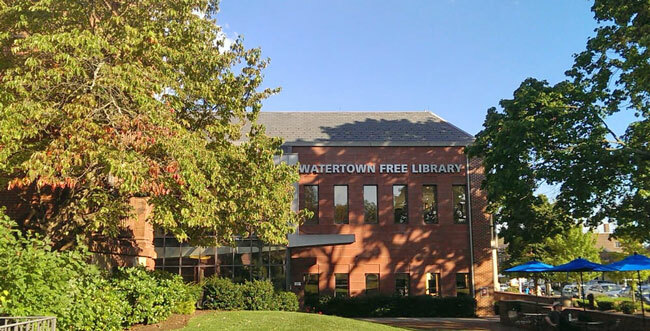 The next day, December 17, join AE911Truth and longtime members and supporters of Boston 9/11 Truth for an afternoon of energizing discussion on the prospect of achieving justice for the crimes committed on September 11, 2001. The theme, “Truth Is Where Our Healing Lies,” is inspired by the closing words of former NIST employee Peter Michael Ketcham’s recent LTE in Europhysics News. Speakers/panelists will include Richard Gage, AIA; Leroy Hulsey, PE; Peter Michael Ketcham, a former NIST employee; and Chris Gruener of the 9/11 Truth Action Project (TAP). The panel discussion will be moderated by Henry MacLean, AIA, and Richard McCampbell, PE. The event will start with a screening of attorney Daniel Sheehan’s inspiring, yet sobering, speech at the Justice In Focus: 9/11 | 2016 conference earlier this year. Panelists will then talk about the investigation that the National Institute of Standards and Technology (NIST) conducted into the destruction of the three World Trade Center skyscrapers. They will conclude with a discussion of possible paths to take toward obtaining a new, independent, and transparent investigation, for the purpose of helping the world fully heal from the tragedy of 9/11. As part of that discussion, Chris Gruener will outline the new global grassroots 9/11 TAP Petition, which its creators hope will reach 4 million signatories by 2021. Admission is free. No registration is required. We look forward to seeing you there!